Monnit Releases Newly Enhanced “Smart” Wireless Repeater. Extends coverage area of your sensor network. Supports 6 messages / minute. Built in memory can queue up to 14,000 messages for delivery to the gateway. AC powered, so no batteries needed. As data is generated in the repeater’s sub-network, it will intelligently store and forward this informa- tion to its parent gateway. This conserves battery power on the wireless sensors, increases network reliability, and intelligently manages network traffic to avoid cluttering. Monnit’s wireless sensor products are designed to detect and monitor functions that are critical to business or personal life, including; temperature, humidity, water, light, access, movement and much more. Monnit’s wireless gateways transmit data between local sensor networks and the iMonnit online monitoring and notification system. Monnit’s software allows for user customization and notification of events via email or text messages. Monnit team members were recently featured in ECN Magazine with an article on designing low-cost wireless sensor networks for real-world applications. A very insightful article about Silicon Valley start-ups turning from software to hardware again. Monnit Corporation Announces Wi-Fi Gateway Partnership with Mojyle LLC. Kaysville, Utah – August 9, 2012 – Monnit Corporation (www.monnit.com) today announced a partnership with Mojyle LLC. (www.mojyle.com), a leading provider of Wi-Fi gateway technology and custom software design & development. The partnership leverages the integration of Monnit wireless sensor technology with Mojyle’s Wi-Fi gateway for use in commercial and industrial applications. Mojyle’s new “SensorGW” allows users to connect the entire range of Monnit WIT™ wireless sensors to the iMonnit™ Online Sensor Monitoring System via existing Wi-Fi networks. Easy to deploy and configure, the gateway allows users to rapidly deploy wireless sensors at locations far away from Ethernet ports and desktop computers. A MonnitLink™ USB gateway connects to the Mojyle SensorGW and the Wi-Fi uplink enables secure wireless LAN connectivity. This new gateway is compatible with all Monnit wireless sensors which are designed to detect and monitor functions that are critical to business or personal life, including; temperature, water, humidity, light, motion, movement, distress and much more. Monnit’s wireless gateways transmit data between local sensor networks and the iMonnit online data monitoring system which records sensor information and sends notifications via text or email if user defined conditions are met or exceeded. Monnit wireless sensors include free basic iMonnit online sensor monitoring with SMS text and email alerting. 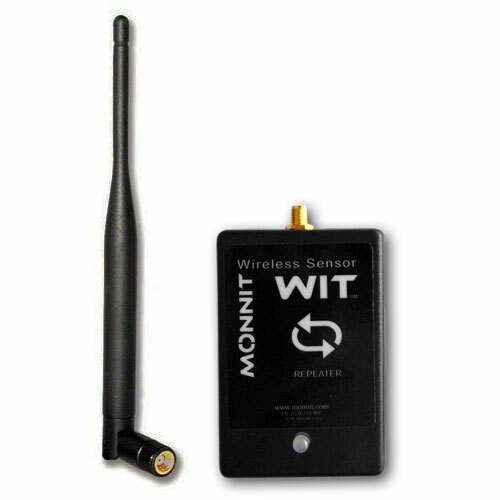 For more information on Monnit sensors, gateways and monitoring call (801) 561-5555 or visit their Website at www.monnit.com. Mojyle is a provider of world-class, highly innovative, sustainable and cost effective solutions such as Sensor Aggregation platforms, IP Gateways and Internet Portals for M2M, Remote Reachability, Sensor Monitoring and automated response systems. Whether you are a large business or a small “mom & pop” shop, you want to ensure employee safety, protect your company assets and track access to your building or certain areas within your facility. 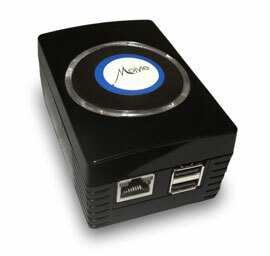 Monnit provides a remote monitoring solution for commercial small businesses. 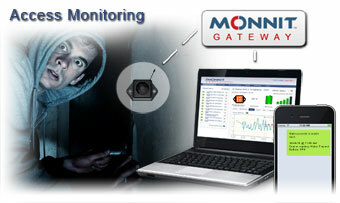 Monnit wireless sensor systems can help you detect and track access to buildings, rooms, cabinets and other areas. Sensor alerts can be set to alert during certain hours of the day, allowing you to know immediately of any unauthorized access after business hours. We recommend using Monnit’s affordable wireless open/closed sensors to track and monitor the doors and windows to any area you want to remotely monitor for access. We also recommend using Monnit’s wireless infrared motions sensors to monitor rooms and open areas for motion/movement of humans or larger animals up to 16 feet away. Know immediately of any unauthorized access to monitored buildings, rooms, or areas. Moving Wireless Gateways and Sensors from one network to another in your iMonnit account. The following steps will guide you through the process of moving wireless gateways and sensors from one network to another in your iMonnit account. The process to move a gateway or sensor is to simply add the device to the network you want it on. By adding a gateway or sensor to a new network, it will automatically be removed from the old network. • Choose “My Account/Settings” from the main navigation. • From left navigation choose “Network Settings”. • Select the network you would like to move the gateway to. • Find the bottom of the section “Gateway List / Add a Gateway”. • Enter the Gateway ID and Security Code from the gateway you want to move to the network. • Select the network you would like to move the sensor to. • Find the bottom of the section “Sensor List / Add a Sensor”. • Enter the Sensor ID and Security Code from the sensor you want to move to the network. • Repeat this process to add more sensors to this network. • Power cycle the gateway to update the gateway’s stored sensor list.